Entertainment tour brings the top-selling console video game of 2017 in the U.S. to military bases in Germany and Kuwait. USO Entertainment tour presents blockbuster title and its all-new DLC Pack, 'The War Machine' to service members this month in Germany & Kuwait. 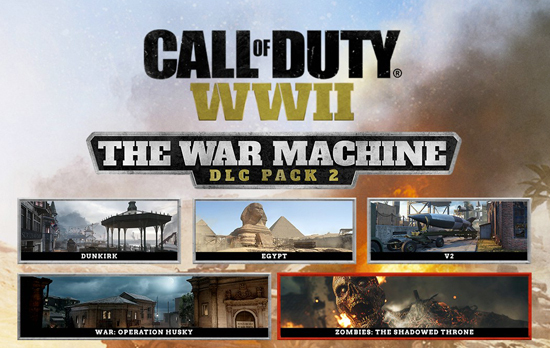 The newest Call of Duty: WWII DLC Pack, The War Machine, to service members overseas with opportunities to play with family members and friends at home; allowing them to stay connected to family, home, and country, throughout their service to the nation. For more than 77 years, the USO has provided a vital connection between service members, their families and the American people as a Force Behind the ForcesSM. The Call of Duty Endowment is a nonprofit foundation founded by Bobby Kotick, CEO of Activision Blizzard. The organization seeks to help veterans find high-quality careers by supporting groups that prepare them for the job market and by raising awareness of the value veterans bring to the workplace. This is the first entertainment tour between the USO and Activision and the Call of Duty Endowment. "We're honored to work with the USO entertainment team through this extraordinary opportunity to spend time with active-duty service members serving overseas. It's a further reflection of our gratitude and respect for their service. The Call of Duty Endowment shares a common bond with the USO to support the men and women of our Armed Forces. We look forward to getting to know as many troops as possible and through this tour provide a moment of entertainment in their deployed battle rhythm. We can't wait to get started!" says Dan Goldenberg, Executive Director of the Call of Duty Endowment.